The North Cascades are a climber’s playground. They offer big mountain terrain in an unbelievable setting. Their jagged ridges and rocky summits are surrounded by snowfields and glaciers, which will put all of your previous mountaineering skills to the test. On this trip we will attempt the Coleman-Deming route on Mt. Baker. This is a classic route, which involves steep snow up to 50 degrees and glacier travel. We are now booking summer 2019 from June-August. Do you have a date in mind? Let us know and we will work to make your dream come true! Day 1: Arrival into Seattle, WA. Day 2: Today, plan to drive 3 hours North to Mt. Baker where you will meet your guides and fellow teammates at the designated campground. We will have a gear check and discuss the upcoming climb. Day 3: Today we will approach Mt. Baker via Heliotrope Ridge. This is a beautiful half day hike passed waterfalls and open ridgelines lined with wildflowers. We will set up camp at the base of the glacier. Day 4: Our summit climb will begin in the early morning hours. 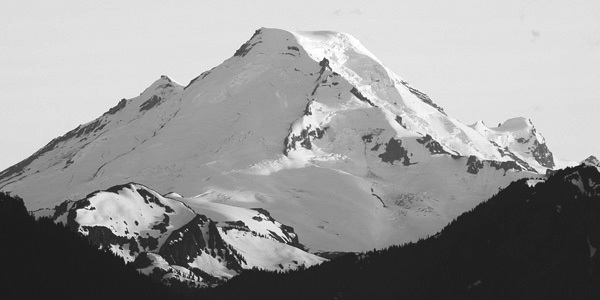 Following the climbers route up the Coleman Glacier will bring us to the immaculate summit of Mount Baker. From here, you look down into the volcano crater - a unique climbing experience. Day 5: We will drive back to Seattle today. You can plan an afternoon departure or spend the day enjoying the city and taking in all of the sights. Located in the Northern portion of Washington’s Cascade mountain range lies a beautiful and heavily glaciated volcano. Mt. Baker rises to 10,778ft and is home to some of the best training ground in the contiguous U.S. The North Ridge of Mt. Baker is a true classic. Glacier travel, steep snow, moderate ice climbing and wild exposure make this climb a must-do on any climbers tick-list. Our traditional itinerary with a twist. 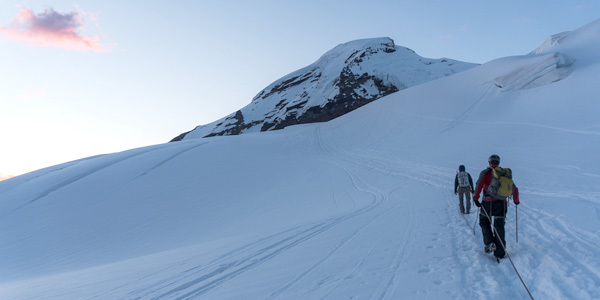 For those with backcountry skiing experience, a ski descent of the Coleman Glacier provides a faster, more enjoyable descent. 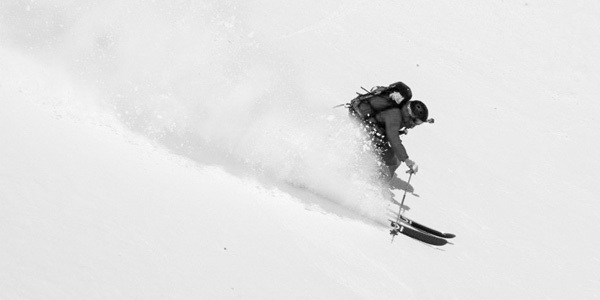 A moderate skin up the Coleman-Deming Route is rewarded with a long ski descent from the summit. Participants must have a suitable touring setup with boots and skins for the climb. Almost 4,000 vert of ski descent. How Difficult is the North Cascades Climbing trip? The mountains in the North Cascades are long climbs with heavy backpacks. They can be very strenuous at times. These peaks require technical rock climbing and long approaches as well as steep snow. Prior rock climbing experience is required. You will need to be in top physical condition. The rock climbing and scrambles are beginner grades. The most difficult climbing is rated 5.6 but mostly it is 4th-5th class. Due to the alpine environment, these climbs take on a more serious perspective than rock climbs of harder grades closer to civilization. Prior rock climbing and camping experience are required. What Are the Age Limits for This Climb? We encourage participants to be age 16 or over, although exceptions can be made based on previous experience. Participants under the age of 16 will need to submit a climbing resume for review. As long as you are in excellent physical condition, are approved by your doctor, and have are able to legally sign the liability waiver, you are welcome to join us! How Long are the Climbing Days? Each day is challenging. At the beginning of the climb altitude is not an issue. However, pack weight is heavy. As we ascend, packs get lighter but altitude takes its toll. Summit day is 14-16 hours long. What are the Sleeping Arrangements on the Mountain? We will provide tents. To minimize the amount of necessary gear, climbers will share a tent. Your tent will be designed to sleep the number of climbers assigned in it [i.e. a 3-person tent will sleep 3 climbers and a 2-person tent will sleep 2 climbers]. We will only make exceptions to this on rare occasions. Please feel free to contact us if you feel you need your own tent. You can expect a 45lb-55lb pack for the first two days. Summit day will require 10lb-15lb packs. Why Do We Begin Our Summit Attempt in the Dark? We get an alpine start for many reasons. In general everything is safer at night when the temperatures are cold and the sun has not begun to melt the snow and ice. The terrain is firmer for easier climbing, snow bridges over crevasses are frozen, the snowpack is more stable and rock fall is less of a hazard.